Perhaps the most common question we get at The Woolery, is what spinning wheel drive system is best for me? What is the difference between double drive and Scotch Tension? What is Irish Tension? Well..take a look! That is the question we tackled in one of our most recent Ask The Woolery videos. The drive system is what determines take-up or how fast the fiber is pulled from your hands. Each drive system is made of the same parts—flyer, bobbin, mother-of-all, drive wheel, drive band, whorl (or pulley), and uprights. How these parts interact determines the kind of drive system. This Lendrum is an example of a Scotch Tension drive system. Scotch tension a "single drive" system, the drive band travels around the drive wheel and the flyer whorl. The brake band travels over the bobbin whorl. You can change the take-up by adjusting the brake band. Many folks like the minute control you get with this system. You have to make micro-adjustments as you spin, particularly as the bobbin fills. This Louet runs an Irish tension or bobbin lead system. Irish tension or bobbin lead is another single-drive system. The drive band travels over the drive wheel and the bobbin flange and the break band is on the flyer. This create a very aggressive take-up that is great for plying and bulky yarns. This Matchless wheel from Schacht is set up in double drive. Double drive, as you may gather by now, is a double-drive system. 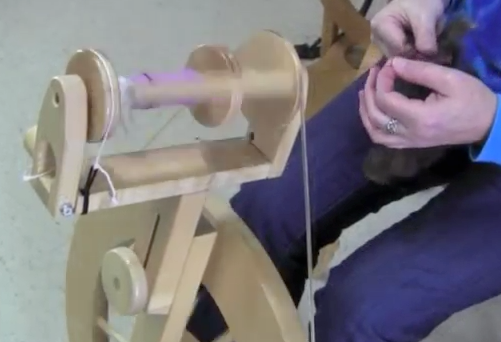 The drive band travels around both the bobbin and the whorl. Take-up is adjusted by changing the tension on the drive band. Many spinners like the consistency of this system. It excels at making medium-weight and soft spun yarns. There you have it in a nut shell. Watch the video to see these systems in action.